Customer Service 509-991-0385 feel free to call with any questions we actually answer our phone. New revised Connect & Monitor Kit that features the True UTV-SBI-18 smart battery isolator built from the ground up for stator charging mechanisms. This kit provides you with the absolute best charge management of your accessory battery while protecting your primary battery for starting. 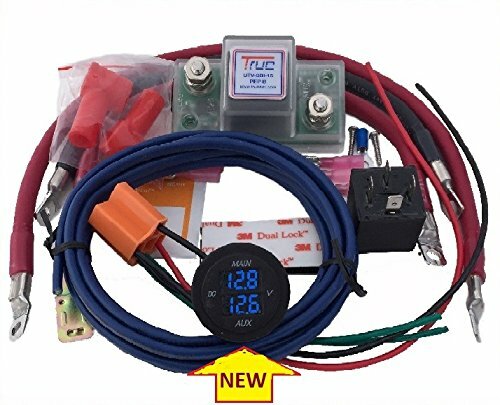 This kit now features a NEW single voltmeter with dual blue displays. This shock/waterproof volt meter allows real-time monitoring of the charge state of your batteries. All True kits feature the industries only fully adhesive sealed 100% waterproof cables. These kits allow for three types of mounting. Traditional screws, 3M Dual LockTM fastener, or leave suspended in cables. Unmatched quality and performance from True Amalgamated.